For the French speaking, espadrilles conjure up the image of plain sneakers or running shoes. Actually those aren’t the espadrilles I’m talking about. In case you didn’t know, the espadrille is of Spanish and Portuguese origin. It was originally a shoe of peasants, warriors, and Mediterranean fishermen. It’s now evolved into a fashion must-have, a staple to have in one’s closet. You can’t walk the streets of Dubai without noticing stylish ladies waltzing around in Christian Louboutin funky espadrilles, or their romantic Valentino counterparts. And you can’t enter a mall these days without falling on rows and rows of espadrilles, in all brands, colors, materials, and designs. I personally consider espadrilles to be the ballerinas of the summer. They’re so versatile in use and look so damn cool. 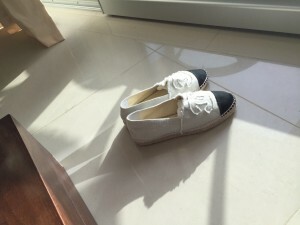 I’ve been particularly lusting over these classic Chanel espadrilles for a while now. I got so excited when I found them in my size in Singapore and just had to snag them. I didn’t stop there. I can’t possibly not own a more casual pair for those relaxed summer days, and a more sturdy one for all my travelling. I just had to. Sorry but not sorry. With your favorite pair of jeans: cool jeans, a white shirt and an original pair of espadrilles, with either a floral or animal print, are just an ideal match. With anything denim: jeans, shorts, shirts, jumpsuits. It makes for an overall natural look. With a sundress: the perfect way to look cute and girly but still feel completely comfortable. You can opt for flat wedges for maximum comfort or wedge espadrilles to look more elegant and feminine. With a caftan: When you’re on holiday, like say….island hopping in Greece (can’t wait for this summer! ), what better way to walk around comfortably and look absolutely summery than in a caftan and colorful espadrilles. And gentlemen, these are also very much in style for you as well. A perfect pair of shoes to easily go from day to night on those summer days where you just don’t know where the plans are headed. I particularly like Soludos for the I-just-don’t-care-what-you-think-of-me look. And no one has to see your feet, thank God. ahhh you hit the spot with me on this post!! 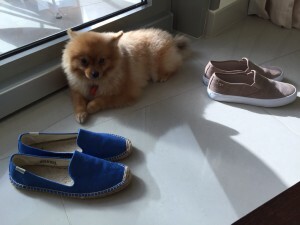 I’m obsessed with espadrilles!! I just bought two pairs in Italy and am still searching for the Chanel ones 🙂 enjoy them!